Look at the picture above. That’s one of three different-sized “Quarry Wall” fixtures we’ve been making and shipping to Home Depot stores across the country for the last nine years. This one’s 24 feet long. 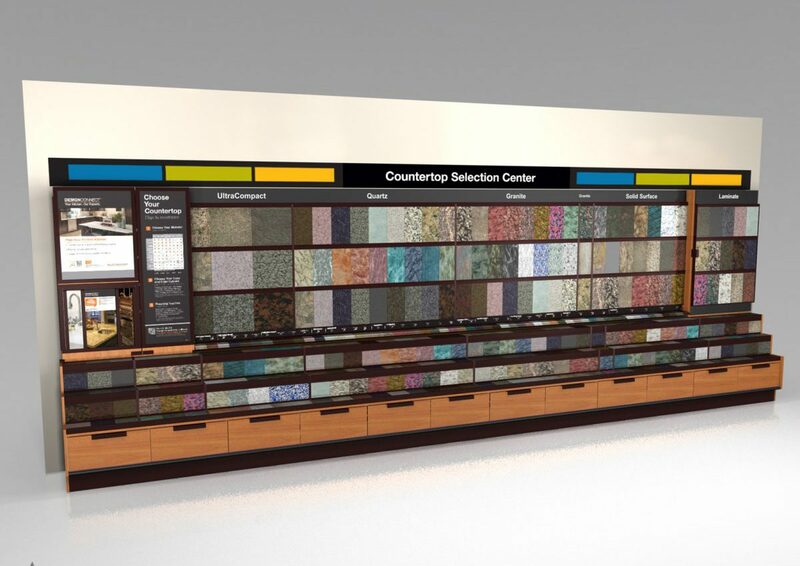 It’s made up of hundreds of individual parts, and its carries about 400 counter-top samples in all different kinds of materials (e.g., quartz, granite, Corian, laminate, wood). When a store needs a unit, all these bits and pieces must be collected, packed and shipped on-time with 100% accuracy. Sounds complicated, right? Well, it gets worse. Every store has its own unique plan-o-gram – meaning its own mix of sample types and colors. And these samples have to be “wrangled” from up to 8 different manufacturers who – let’s face it – don’t always make giving us exactly what we need when we need it their top priority. Enter Adam Nadler and the Art Guild Quarry Wall team. Their challenge – as presented by The Home Depot – is to ensure every unit ships perfectly and on-time. And when that’s simply not possible, to document what’s missing, collect it and ship it all in a single follow-up “fix-it” package. This means working with every manufacturer, and checking everything they send us. Is it the right color? Is it the right size? Is it damaged? Then recording all of this and reporting the status of every shipment in a weekly call to The Home Depot. Art Guild has always prided itself on going above and beyond to ensure the success of customer programs. It’s great to see that recognized. Congratulations to Adam and the many other people here who helped make this happen including Debbie Strano, Boris Brimshan, Mark Weaver, Yoel Weiss, DJ Shelton and Kim Metz.